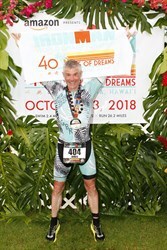 The inaugural Ironman Triathlon race was held in 1978 and in 1981, the race moved from the tranquil shores of Waikiki to the barren lava fields of Kona on the Big Island of Hawai'i. 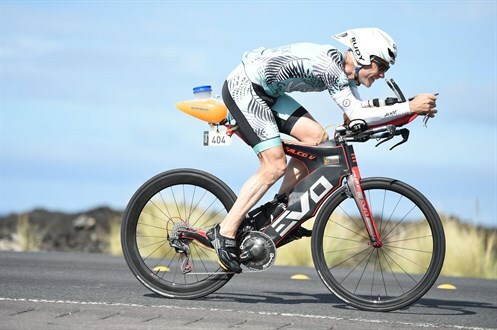 Along the Kona Coast, black lava rock dominates the panorama, and athletes battle the "ho'omumuku" crosswinds of 45 mph, 95-degree temperatures, 90% humidity and a scorching sun. Just 15 people came to Waikiki to take on the first Ironman race in 1978. For this the 40th anniversary race in 2018 there were 2,400 competitors who represented the top 1-2% in their age groups, having gained qualification with fast finish times in one of 42 qualifying races throughout the world. 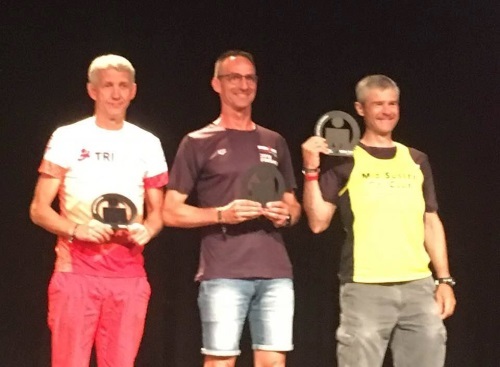 It took a huge effort for me to gain qualification for this race because 10 years of Ironman racing has shown that even on a good day I do not tend to finish within the top 2%. Beyond the usual high volume of training, I raised my game by traveling alone to Colorado in June 2018 to stay at altitude in the Rocky Mountains in an out of season ski-resort airbnb rental. 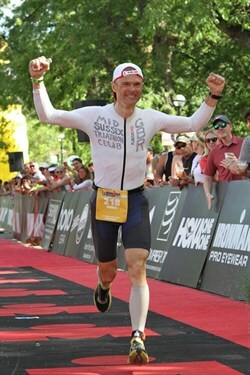 This altitude adaptation was successful and allowed me to clinch 1st place (by just one minute) in the 55-59 age group at the 5,000 foot elevation of Ironman Boulder, Colorado just 10 days after arriving in USA. I got a welcome boost during that run at Boulder when resident professional, Tim Don, cheered me on from the crowd with "Go Mid Sussex!" having read the lettering on my tri-vest. 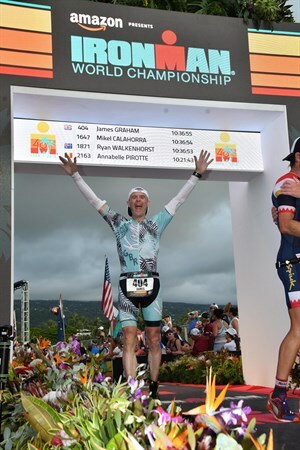 A burst appendix (with post-operative infection) 7 weeks before this Ironman World Championship in Kona abruptly halted all training for three weeks at a critical time and threatened to cause my withdrawal from the race completely. The target for race day at Kona became simply to finish within the 17 hours cut-off time. I hoped to do a fast cycle but not over-exert myself on the swim or the run. 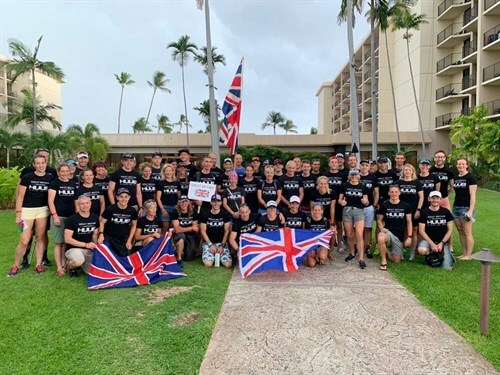 Sea conditions were perfect and Great Britain's Lucy Charles broke the female swim course record by completing the 2.4 miles in just 48 minutes, on her way to finishing second overall. I placed myself at the back of the mass start of swimmers to keep out of trouble and I completed in 1:39, which was almost the slowest in my age group. I was placed 124th in age group at the end of the swim. The winds were gentler than usual, which may explain why both the male and female cycle course records were broken by professionals in 4:09 and 4:26 respectively. My cycle of 4:58 (average speed 22.6 mph) was one of the fastest in my age group so I advanced to 44th place in age group. Despite temperatures being a little cooler than previous years, the heat and humidity was brutal. By half-way there were many athletes walking and some were in distress with nausea and exhaustion. Some of the professionals had slow runs, including Tim Don and Lionel Sanders. I made full use of the copious amounts of water, salt, energy gels and ice provided at each of the 26 feed stations. Surprisingly, I felt fine throughout and maintained a steady pace for the the entire run, even in the dreaded natural energy lab section. My marathon run time of 3:51 was comparatively fast so I advanced to 24th in age group. My wife Helen was volunteering at the finish line and I gratefully fell into her arms to complete a wonderful race experience. My finish time of 10:36 is one of my fastest for an Ironman race, despite it starting with a swim that was 27 minutes slower than my previous best. I think I have only ever gone faster at the famously fast Ironman Barcelona course. This result was an hour or two quicker than I had expected at the start of the day. Germany's Patrick Lange took 9 minutes off his own course record then (on one knee) proposed marriage to his girlfriend (in English) at the finish line. Switzerland's Daniela Ryf broke the previous course record and was 24 minutes faster than her 2017 winning time despite a jelly-fish sting at the beginning of the swim that slowed her progress and almost made her quit the race. That jelly-fish sting seemed to unleash astonishing powers to enable Daniela to overhaul Lucy Charles's substantial lead, whilst breaking the female cycle course record. I am so lucky to have the support of family and friends to allow me to participate in such a terrific sporting event. The many NHS staff that got me through appendicitis gave me first rate care and literally saved my life. Ironman Kona is a very special event and it has been a privilege to participate alongside wonderful volunteers and world class athletes. 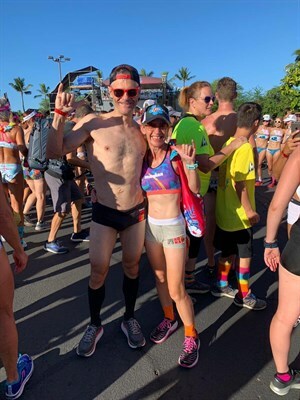 Oh, yes…… and the annual Kona race-week charity "Underpants Run" plus the "Parade of Nations" were a fun traditions not to be missed. Helen Graham…..You Are An Ironman !!!!!! Helen's 3rd attempt at completing 140.6 miles of triathlon was a great success. All the sweeter following the missed bike cut-off in Florida 2015 and the retirement during the Florida 2016 swim due to breathing difficulties. 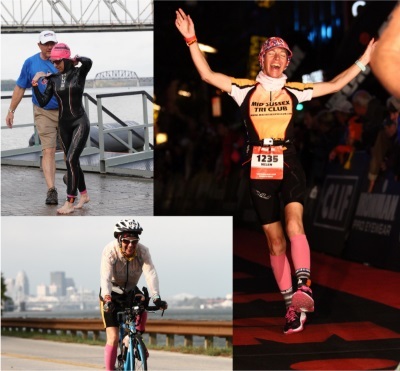 Helen entered Ironman Louisville 2017 at the beginning of the year but injury and ill health prevented her from following a conventional training plan. Preparation consisted of regaining the ability to run long distances, swimming as much as possible in Ardingly reservoir and learning to enjoy cycling fast down hills. Helen attempted to change her swim style from breast-stroke to freestyle in 2017 but progress was slow and for Louisville she reverted back to breast-stroke. In summer 2107 Helen completed the Prudential London Ride-46 and the Penticton Long Distance Triathlon (3km,120km,30km). However, just a few weeks before Louisville she missed the bike cut-off at Weymouth 70.3 having struggled with hypothermia and sea-sickness during the swim. The volunteers and local athletes at Louisville were very friendly and encouraging with lots of positive advice. The 3.8km wet-suit swim in the Ohio River was moderately challenging and busy despite the rolling-start with around 2,500 athletes. The first third of the swim is against the current then the rest of the swim has the current in your favour but then the water is more choppy. Overall this is a relatively fast Ironman swim course and Helen's 1:35:02 ranked her 2,201st coming out of the swim. This was the first time that Helen had ever managed to draft off another swimmer for a substantial time during a race. The 112mile bike course is relatively benign with rolling hills, good surface and picturesque scenery. However, a storm hit during the second half of the cycle with heavy rain and high winds. Leaves, twigs, branches and fruit blown from the trees made sections of the road hazardous for cycling but the race continued. Helen completed the cycle in 7:58:02 and was placed 2,208th overall at that time. The Louisville 26.2mile run has a pleasant mostly flat course with good crowd support and a wonderful finish line atmosphere. 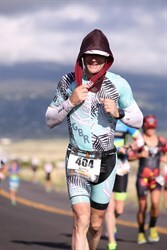 The run is a big challenge even for triathletes who are good runners because there is so much fatigue by the final stages of an Ironman race. However, Helen knew that she would complete the race within the cut-off times having completed both the swim and cycle faster than expected. Plenty of time to do a comfortably paced run whilst enjoying every moment of this much anticipated experience. The Louisville finish is one of the best on the Ironman circuit with lots of bright lights, music and enthusiastic supporters as runners hit the red carpet that takes them to the arch that is located in the centre of the vibrant "Fourth Street Live" entertainment and retail complex. Helen's 5:38:48 run allowed her to overtake 459 athletes so that she finished 1,749th overall. Finish time 15:41:41. 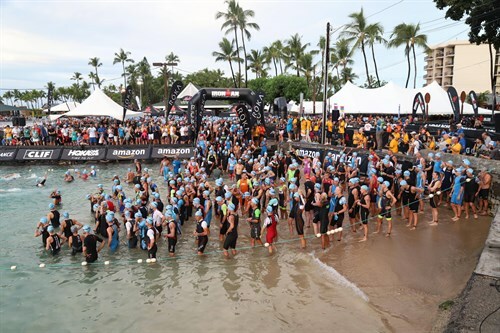 There were 2,271 finishers from the 2,750 athletes registered and it appears that around 2,500 started the swim. Helen arose early next day to get in the queue for finishers kit and purchased everything available in her size. Apparently these trinkets will be needed for the lifetime of bragging to come. 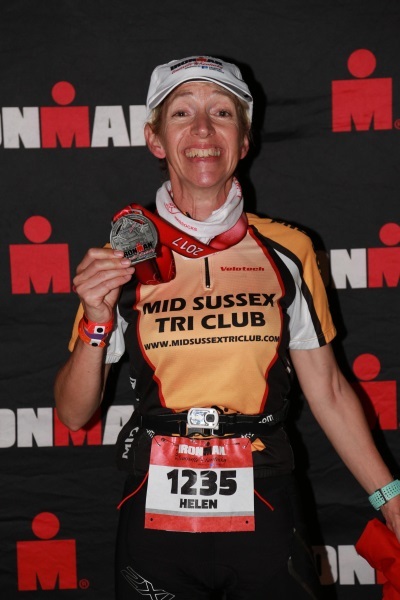 Helen is hugely grateful for all the support from family and friends, especially those at Mid Sussex Triathlon Club and We Run Hassocks. 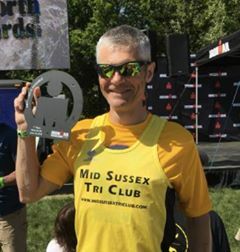 Two members of Mid Sussex Tri Club ventured up to Keswick in the Lake District over the weekend of 17th and 18th June to compete in the Lakesman full distance triathlon, consisting of a 2.4 mile swim, a bike leg of 112 miles and a 26.2 mile run. With the start and finish lines and transition based on the shores of Derwent Water, some stunning, if somewhat hilly, scenery was guaranteed to competitors. In its second year, the race has a small but friendly atmosphere but with all the organisation and logistics of big brand races. The race organisers were clearly hoping for better weather than the torrential rain of the inaugural race but probably weren't expecting the temperature to be in the mid to high 30s for the duration of the race! 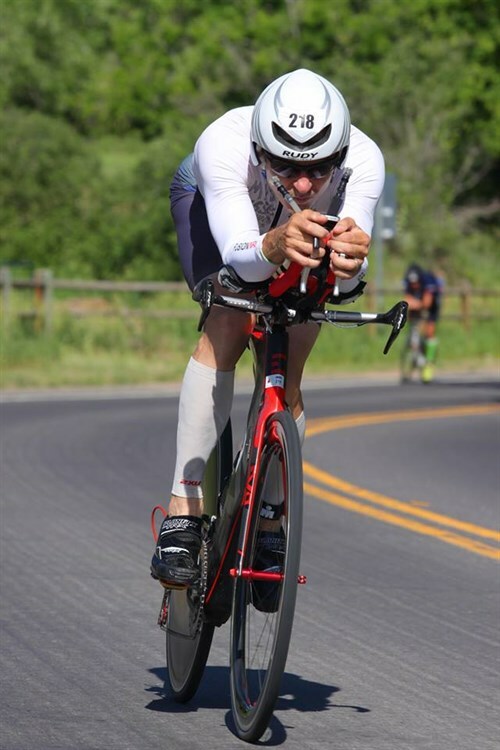 With 2 hours 20 minutes permitted for the swim and a hard cut off of 10 hours 30 minutes after race start to commence the run, Clair Hunt was aiming to use the swim leg to buy herself time for the bike. Her strategy was therefore one of getting close to the melee on the start line and being as competitive as possible. Matthew Critchley, as the weaker swimmer, however had a different strategy; namely to stay out of trouble on the swim and pick off places on an opportunistic basis. 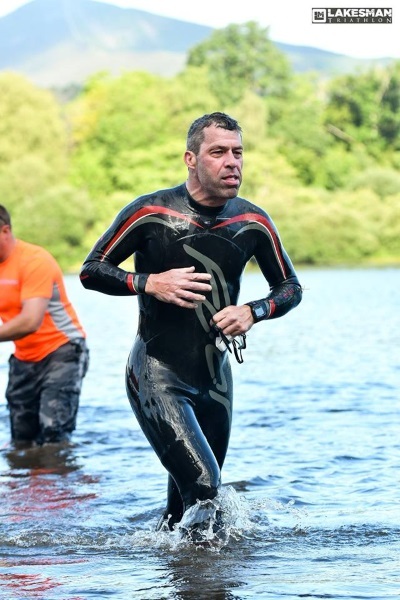 The strategy appeared to pay off for Matthew emerging from the water in a time of 01:43:10 just 3 minutes 43 seconds ahead of his team mate. This put them in 247th and 260th places respectively overall. Even with the benign conditions and a water temperature of 18-19 degrees C, one hour 45 minutes is a long time to be immersed and there always remains a risk of hypothermia. Unfortunately for Clair the effects of exposure had taken its toll and the race marshals directed Clair to the medical tent for treatment and with that her race was over. Matthew's strength was always going to be the bike leg and by the midway point had pulled back to 141st place. Strong winds along the Cumbrian coast and extreme temperatures slowed the field over the second half of the course. Matthew had dropped back slightly to 165th overall coming into transition for the second time in a total elapsed time of 08:08:16, exactly 02:00:04 behind the race leader. Consistent pacing would always be critical to ensuring a strong finish to the race, particularly given the prevailing conditions. With 5 laps of a 5.25 mile circuit, Matthew was able to maintain a consistent pace with lap times within a couple of minutes of each other to finish the marathon in 149th place recording a time of 05:12:30. This gave an overall time of 13:29:36, finishing in 174th overall and 04:13:55 behind race winner Joe Duckworth. The first lady, Nicola King from the Arragon's Triathlon Club, finished in a time of 11:20:44 putting her in 34th place overall. 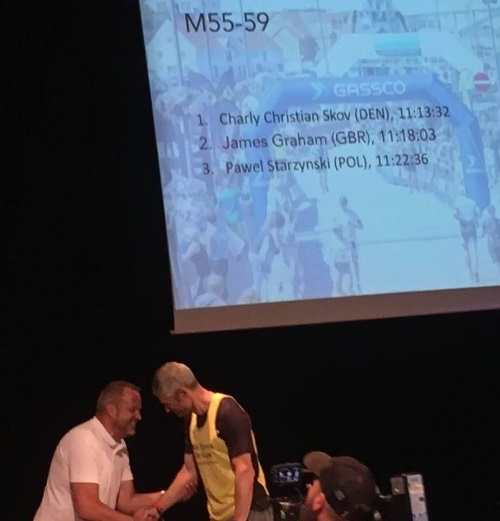 It was both Clair's and Matthew's first attempt at this distance having both successfully competed at a number of middle distance and half Ironman races. There clearly remains unfinished business at Lakesman for the pair of them, albeit for different reasons. Clair has vowed to use this opportunity to learn and come back stronger next year and Matthew is keen to try again but next time, with luck, in more temperate conditions and see what time he can post.